KAMP Central: Become Someone's Hero - Volunteer! "Volunteer by Day; Hero for Life" is not just our camp motto, but it is also our creed. Everyone that works at KAMP Dovetail is a volunteer. In the simplest of terms, we don't receive money for our work. We do get free t-shirts and three meals a day during KAMP, but that is only the tip of iceberg of what we all actually get. As our motto says, we are volunteers during the day for week of KAMP, but in the eyes of our campers, we are much more! Many of our campers come to us because no other camp can accommodate their special needs. Sadly, many of our campers have no other activities that they can attend during the year. That makes KAMP Dovetail the highlight of their summer and year. You are not just a volunteer, you are the one that helps them experience the outdoors - you are the one that shows them they deserve love and understanding from others - you are who their tears are for on Friday when your camper has to leave - you are their friend - you are their hero. KAMP Dovetail is a week-long summer camp for kids and young adults with disabilities. At KAMP Dovetail, we welcome young people with any of a wide range of disabilities, ranging from ADD/ADHD to Downs Syndrome to Cerebral Palsy and anything in between. To get an overall view of KAMP, please take a few minutes and watch some of the videos of past summers at KAMP. If they don't bring a tear to your eye, at least your heart will be warmed. 1. First thing to know is what kind of volunteer do you want to be? We need many different people with many different skills. Most of our volunteers are individuals that work directly with our campers. PLEASE NOTE: If you have a specialty skill or trade, such as carpentry, electrician, plumber, EMT, nurse/doctor, law enforcement, or any other such profession, and would like to volunteer your time and talents, please contact our Executive Director directly. The contact information can be found by clicking 'Contact Us!' in the Main Menu block. 2. If you would like to work one-on-one with our campers, you can either choose a group in which you would like to volunteer, or you may be placed in a group that needs you the most. If you do not already know which group of which you would like to be a member, it is a good idea to attend a volunteer meeting early in the year - like in January or February. The volunteer recruiting is just beginning and many groups may be looking for great people like you! And that's it! Once you have met the following requirements, you will be set and ready to go for KAMP! 1. 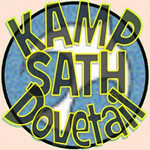 Time Commitment: Kamp Dovetail is held the third full week of June. Father's Day is always the Sunday that begins the week of Kamp. Campers arrive on Monday afternoon and depart Friday afternoon. ​ Set-up for the week of Kamp begins the week before and usually is completed by the week after. Volunteers ​may report to KAMP Sunday in the mid-to-late afternoon and plan on staying at KAMP until the following Saturday evening, usually around 5:00 or so. In addition to the week of KAMP, volunteers ​need to participate in four​ volunteer meetings at Hopewell Center (see the 'Maps' link in the Main Menu box). 2. Get Trained: Every volunteer is required to attend four meetings. During the meetings topics covered will including disabilities, First Aid, and how to be a Kamp Volunteer. We always encourge questions and try to have answers. ;) These meetings are designed to provide you with the basic skills necessary to be a successful volunteer and have a great time doing it! 3. Help Out: Our camp is run mostly on the generosity of people, organizations, and businesses. The staff, group leaders and volunteers generously give a week of their summer to make the week a fun filled event for individuals with disabilities. A considerable amount of the paper goods (cups, plates, napkins, forks...) are donated by local businesses such as McDonald's and Wendy's. A tremendous amount of food stuffs, like ice cream, hamburgers, pulled pork, and baked potatoes is donated by local church groups, organizations, and businesses. Anything you can do to help out along the way will be greatly appreciated! 1. A volunteer at KAMP begins the day before breakfast with helping their camper prepare for a fun filled day of swimming, putt-putt, recreation, fishing, horseback riding and so much more. After dinner campers and volunteers may engage in skits, dances, a carnival or other special events. The campers' bedtime is between 9:00 and 10:00. Bedtime for volunteers is between 11:00 and midnight, at the discretion of the camp director. 2. Most of our volunteers and staff sleep in tents for the week of camp. There is limited space for trailers/RV's and their use will need to be approved by the camp director. 3. Our volunteers report the week of camp is the hardest fun they have ever had. Many of the volunteers return for multiple years and have the shirts to prove it! Each year new camp shirts are designed about the theme of the week. 4. Come prepared! The weather during the week of camp is always a challenge. It is best to come prepared for a wide range of possible weather events. At night and in the evenings, once the sun goes down, it can get a bit chilly - be sure to pack your long pants, a hoodie AND a jacket. Be ready for the rain, too. Rain coats or ponchos work best. During the day, it can get HOT! Be sure to bring appropriate shorts and shirts. There are way too many things to throw at you now, all of which will be covered in your training courses. The main thing is that we at KAMP Dovetail want each and every person, volunteers and campers alike, to have a time they will never forget. And we want YOU to be a part of it!